Chromeboxes—the diminutive, desktop-like cousins to Chromebooks—are aimed at education and business, and that's also the target audience of Lenovo's ThinkCentre Tiny line of modular All-in-One PCs. It was only a matter of time before the two came together, and it happened Monday with Lenovo's announcement of the Chromebox Tiny. The ThinkCentre Chromebox Tiny joins a literally small herd of Windows-based cousins in the product family. All of the systems measure just a little over 7 inches square and a scant 1.4 inches thick. (You'll see them called 'one-litre' or 1L computers in some metrically-oriented circles.) The Chromebox Tiny weighs 2.2 pounds. 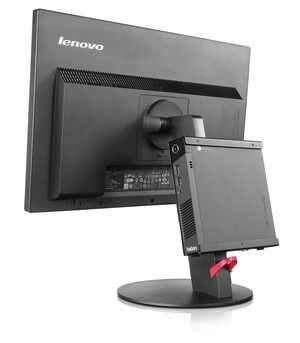 The Lenovo ThinkCentre Tiny product line lets you mount a small PC on the back of the display. The extremely small computers can stand on their own or be mounted—they come with a VESA mount. 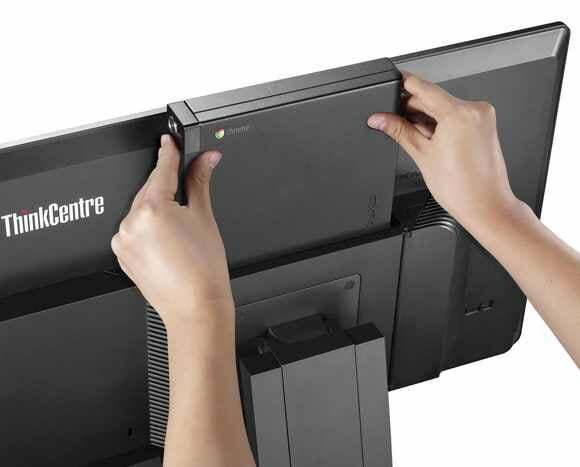 They can be slid into the back of a Lenovo Tiny in One 23, which looks like a 23-inch display but is an innovative, modular All-in-One system that can accommodate any of the ThinkCentre Tiny PCs. The Chromebox Tiny packs a lot of ports into its small profile. On the front, you'll find two USB 3.0 ports and a combo headphone/microphone jack. On the back you'll find two more USB 3.0 ports, an HDMI port, and a connector for a Wi-Fi antenna. Lenovo was scant on any further details, unfortunately, such as the CPU, RAM, or onboard storage. Worst case, we'll get full information closer to when the ThinkCentre Chromebox Tiny ships in June, with a starting price of $199. Why this matters: Corporations and classrooms alike have been flocking to Chrome hardware because they offer simplicity, and an often-significant cost savings over comparable Windows or Mac computers. The Chromebox Tiny's Windows cousins, for instance, start at $450.